Cab hire service Uber has been taken to a London employment tribunal by two of its drivers who claim it is acting unlawfully by not offering holiday and sick pay. 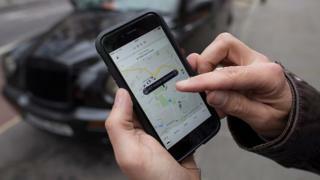 Uber, which allows users to book and pay for a cab through a smartphone app, is used by some two million Londoners. The test case centres around whether the drivers can be considered workers or, as Uber argues, as self-employed. The two legal definitions are accorded different employment rights. Workers are given similar rights to employees in that they are entitled to holiday pay, are protected from unlawful deductions from their pay and may be entitled to sickness pay. This is the first time that Uber will have faced legal action in the UK over whether their drivers are workers or self-employed. The two test cases, which will determine a further 17 claims against the firm, are being brought by law firm Leigh Day on behalf of the GMB union. It argues Uber does not currently ensure its drivers are paid the minimum wage or that they receive paid holiday. This test cases involves two drivers, James Farrar and Yaseen Aslam. On the first day of the tribunal case David Reade QC, acting for Uber, sought to demonstrate that Mr Farrar was self-employed as he can choose when he works. "I don't believe I have a free choice" Mr Farrar said. "I consider Uber work as my job." Mr Farrar also insisted that his pay was often lower than the national minimum wage. In a witness statement he said that Uber claimed it paid him £13.77 on an average hourly basis, based upon the hours he was logged on to its driver's app. But Mr Farrar insisted that his net earnings in August 2015 after expenses amounted to just £5.03 an hour. David Reade QC suggested that during that period Mr Farrar had cancelled a high number of jobs sent by Uber. But Mr Farrar denied this, claiming that the number of jobs he did per hour had been in line with Uber's recommendation. "I don't see that I lost any money," he said. "I worked as hard as I could". The union also says Uber does not provide its drivers with the rights normally afforded to employees, claiming instead that they are "partners". Uber has always maintained that its drivers are self-employed and as such are able to work as little or often as they wish. Justin Bowden, national secretary of the GMB union, told the BBC: "The issue here is not about taking away the flexibility… but the high degree of control that Uber exercises over their drivers. "You either have employment laws that people have to follow or you don't." Mr Bowden said the GMB union wanted to ensure that Uber drivers had the same employment rights as everyone else. Uber's rise has been meteoric. In just six years it has ballooned from a tiny start up to a £50bn company spanning 450 cities across 70 countries. But it's not been an altogether easy ride. This is the latest in a series of legal challenges about the way it does business. At the heart of the matter in this case, is an argument over whether the UK drivers who earn money from the app work for the company or for themselves. If these judges rule that they are company workers, tens of thousands of other Uber drivers could potentially claim more cash. It's not clear if that would then push up fares. A ruling in favour of the two drivers could lead to dozens more coming forward and affect the firm's reliance on those it considers as self-employed. "This claim is vital for the thousands of Uber drivers who work in England and Wales and has implications even wider than that," Annie Powell, employment lawyer at firm Leigh Day said. "We are seeing a creeping erosion of employment rights as companies misclassify their workers as self-employed so as to avoid paying them holiday pay and the national minimum wage," she said. The case also claims that Uber acts unlawfully by deducting sums from drivers' pay for customer complaints. Uber said it was rare for pay to be deducted and it would only occur in circumstances where the route taken by the driver was deemed to be excessively long, for example. In a statement Jo Bertram, regional general manager at Uber UK, said: "More than 30,000 people in London drive with our app and this case only involves a very small number. "The main reason people choose to partner with Uber is so they can become their own boss, pick their own hours and work completely flexibly. "Many partner-drivers have left other lines of work and chosen to partner with Uber for this very reason. In fact two thirds of new partner-drivers joining the Uber platform have been referred by another partner." The tribunal is expected to last until the start of next week but a ruling is not expected for several weeks. Using the Uber app, passengers can request to be picked up from any location within London, or 450 other cities worldwide. Passengers pay Uber for the journey, and it then passes on a percentage of that payment to the driver. The firm, whose investors include Goldman Sachs and Google, has grown rapidly around the world and is valued at $62.5bn (£47bn) but has faced protests, bans and restrictions in a number of cities. Last month, Uber agreed to pay $7.5m to settle a lawsuit brought by drivers over background checks at the Federal Court in San Francisco, where the app is based. In the UK it has fended off attacks from London's black cabs to have the app ruled illegal, and transport bosses decided earlier this year not to impose tough new rules on the app.